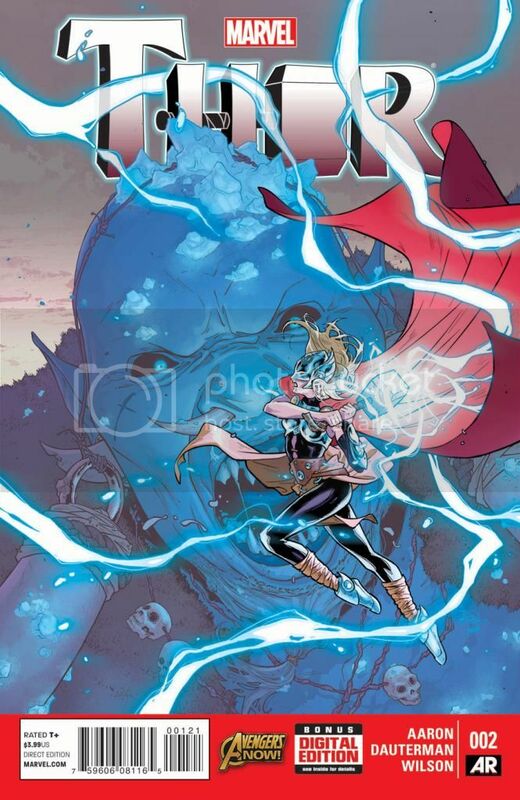 I’m disappointed that we don’t know who the new Thor is, but this is still a fun issue. Thor (we’ll just call her that, shall we?) 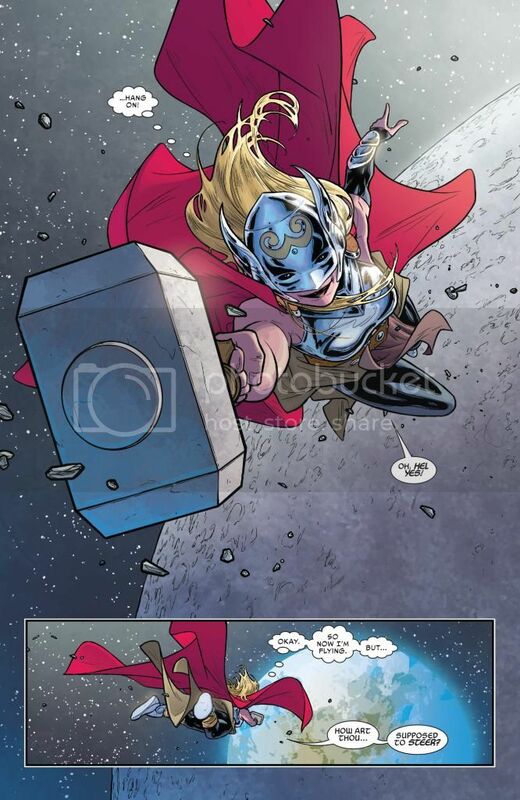 picks up Mjolnir from the surface of the moon, and has to figure out how to fly. (Jason Aaron conveniently doesn’t tell us how she got to the moon in the first place.) Mjolnir has effects and powers that I didn’t know about before: it gives Thor knowledge about Frost Giant history, and it even glows, like Gandalf’s staff. She infiltrates a creepy Frost Giant holdout in the middle of the frozen Pacific Ocean, where Avengers are encapsulated in ice. 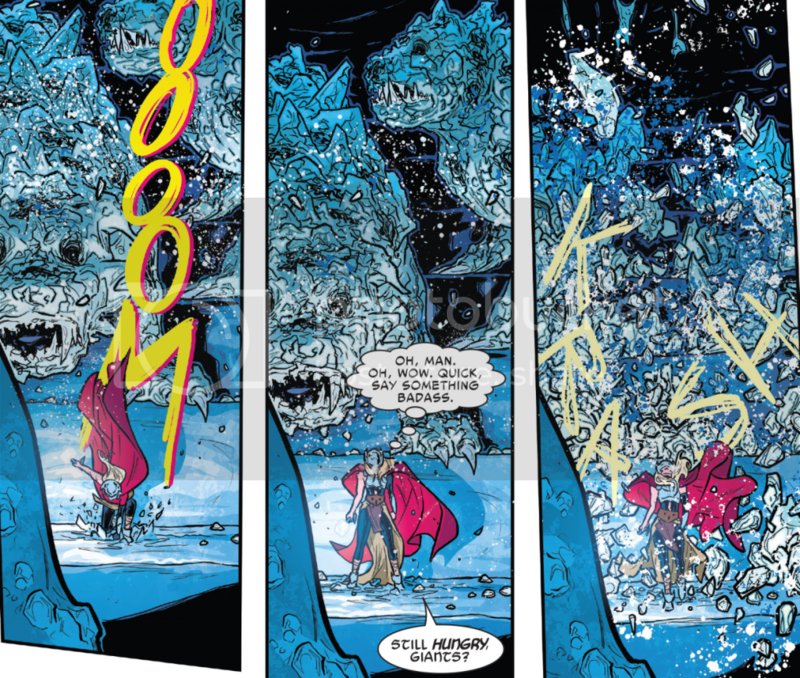 She takes on six Frost Giants by herself, and lights them up with lightning. Matthew Wilson makes this part dazzling, with all kinds of bright white pulses shattering ice everywhere. Marvel seems to have a thing for psychopath CEOs: Here, Dario Agger of Roxxon could easily swap with Harrison Snow in All-New X-Factor, except for the reveal that he is more than just a human. Thor shows that she recognizes Agger, which adds another piece to the puzzle. I’m thinking Aaron wants fans to guess that she is Roz Solomon. Maybe she is or maybe she isn’t, but one thing’s for sure: she’s the goddess of thunder, and she’s not to be trifled with. Hawkeye vs. Deadpool #2 REVIEW: 7.5/10. Kate Bishop, Typhoid Mary, and Black Cat!